7:02am Monday Morning Update: #CountyFire [update] east of Lake Berryessa (Yolo and Napa Counties) is now 90,288 acres and 73% contained. Evacuations in effect. 6:39pm: #CountyFire [update] east of Lake Berryessa (Yolo and Napa Counties) is now 88,425 acres and 55% contained. Evacuations in effect. 7:17am #CountyFire [update] east of Lake Berryessa (Yolo and Napa Counties) is now 88,375 acres and 48% contained. Evacuations in effect. 6:24am PT #CountyFire [update] east of Lake Berryessa (Yolo and Napa Counties) is now 88,375 acres and 37% contained. Evacuations in effect. 6:28pm: #CountyFire [update] east of Lake Berryessa (Yolo and Napa Counties) is now 86,000 acres and 27% contained. Evacuations in effect. 7:13am PT #CountyFire [update] east of Lake Berryessa (Yolo and Napa Counties) is now 82,700 acres and 25% contained. Evacuations in effect. 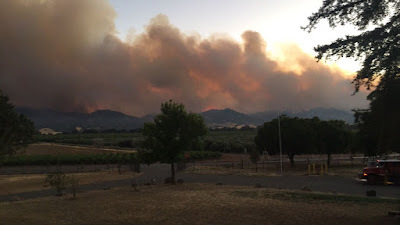 6:42am: #CountyFire [update] near County Road 63 and Highway 16, Rumsey Canyon (Yolo and Napa Counties) is now 70,000 acres and 5% contained. Evacuations in effect. 7:13pm PT: #CountyFire [update] near County Road 63 and Highway 16, Rumsey Canyon (Yolo and Napa Counties) is now 60,000 acres and 5% contained. Evacuations in effect. 7:33am PT: #CountyFire [update] near County Road 63 and Highway 16, Rumsey Canyon (Yolo, Napa and Lake Counties) is now 44,500 acres and 3% contained. Evacuations in effect. 11:33am PT: #CountyFire (formerly #GuindaFire) [update] near County Road 63 and Highway 16, Rumsey Canyon (Yolo County) is now 22,000 acres. 9:50am PT Update: Following is information from CAL Fire. Evacuation Advisory: South of County Rd 81 and West of County Rd 85. 7:14am PT BREAKING UPDATE: #CountyFire (formerly #GuindaFire) [update] near County Road 63 and Highway 16, Rumsey Canyon (Yolo County) is now 16,500 acres. Evacuations in effect. 8:55pm PT Update: #CountyFire near County Road 63 and Highway 16, Rumsey Canyon (Yolo County) is now 8000 acres. Evacuations in effect. BREAKING NEWS: Yolo County - Firefighters are battling Yolo County 4,000+ acres #CountyFire on Saturday, June 30th, 2018 in California. #CountyFire (Yolo Co) - reporting 4000 acres, fire has jumped Road 78 in Brooks to the south w/ several spots becoming established out in front. Fire is also now bumping up against Blue Ridge. This fire was a 1,000 acres earlier today.